Bonjour from the South of France, my favorite place to be. Aside from the wonderfully mild climate, the beautiful colors, the delicious food and the abundance of art, it's the ideal area for travelers. You can find all sorts of accommodations in many price ranges, and the transportation system makes it easy to visit the many small villages as well as get around my favorite base of operations, Nice. 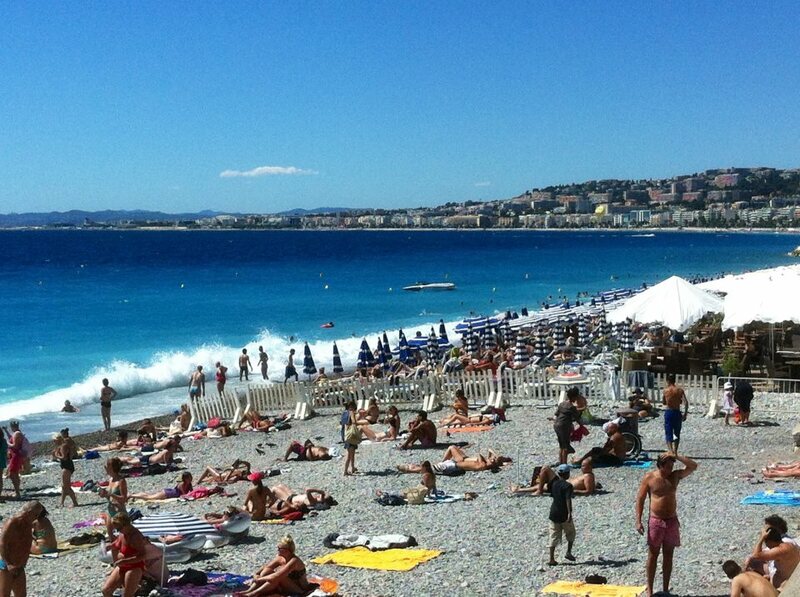 It was a beautiful afternoon in Nice. 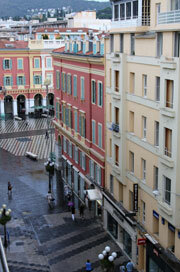 I'm currently renting an apartment in the delightfully charming Vieux Nice (Old Nice), which dates back several hundred years. I found this little gem on www.homeaway.com and described the process of renting it in a previous post. If you're interested in coming to Nice yourself, you are probably wondering how to get to your destination. It's actually very easy. If you're coming from another area of Europe, you can arrive by train at the station Nice Ville. From there, make a left when exiting the station and walk down a block to the tram, which makes many stops around town. Several buses run from the front of the station throughout the city. You can also pick up a cab in front of the station. 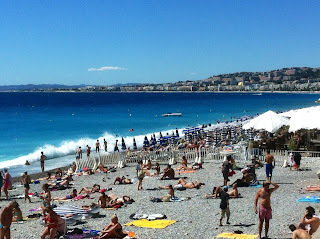 If you fly into Nice's airport on the edge of town, you can take a bus to several towns in the area as well as the buses that go to the train station and the bus station with several stops along the way. The cost is a mere 4€, and you can use the ticket for the rest of the day on the Nice tram and any Lignes d'Azur bus. If you don't want to deal with the bus, taxis cost 35-50€. Or if you're one of the many jetsetters who frequent this area, and you're heading to Monaco, you can hire a private helicopter. Speaking of the bus, it's clean and reliable, making it the most convenient way to get around Nice and the surrounding villages. It's also remarkably cheap at only 1€ per ride, 4€ for a day pass or 15€ for a weekly pass. These passes are also valid on the Nice tram. Buy bus tickets from the driver, and buy tram tickets from the machines found at every tram stop. Monthly passes are also available for 40€ at a Lignes d'Azure office if you are going to be in the area for more than a few weeks. For these passes, you have to bring a passport and a passport-sized photo as well as a photocopy of the passport, which you can make at the office. Why you need these items is a mystery to me because the clerk scans your passport, throws away your copy and returns the photo to you. I really wanted to ask the clerk why I had to go all the way back to my apartment for the extra photo, but I didn't want to make her mad at me, so I just kept saying merci to avoid engaging her in a conversation that could lead to a question that I was unable or unwilling to answer. Now that I have my bus pass, I'm ready to venture out int the Sunny South. So why is a region that boasts 300 days of sun each year forecasting rain for the next six days? Bring some plastic flatware so you can have a picnic. You probably have a list of standard items that you pack when you’re taking a trip. Add these small items to save time and aggravation on your next journey. When you have forks, spoons and knives, you can pick up some local bread, cheese and other goodies and have a picnic in a scenic area. What’s a picnic without some nice local wine? Just make sure you pack it in your checked luggage because corkscrews are forbidden in carry-on bags. Extra bags have several uses. You can place your dirty clothes in them to separate them from the clean clothes or use them as a beach bags or tote bags. You may feel fine when you leave home, but that doesn’t mean you won’t catch a cold or have an allergy attack or headache during your trip. If you’re going to a foreign country, and you don’t speak the language, it can be a real hassle to get the medicine you need. Many countries keep any type of medication, even non-prescription, behind the counter, so you will have to explain what you need to the pharmacist. In addition, medication is different in other countries. When I went to France last year, I came down with a terrible cold, and I was frustrated to learn that there was no Ny-Quil in the entire country, and the strongest medicine available did nothing to ease my symptoms. When you pack the cold medicine and pain reliever, be sure to throw in an extra supply of prescription medication in case your return home is delayed. Make sure you pack it in your carry-on luggage so you won’t have a problem if your checked bag is lost. As the daughter of a fireman, I learned to locate the emergency exit upon checking into a hotel and to make sure I have a flashlight in case of fire. My flashlight has also come in handy during a power failure. Sure, the light from a smartphone will help in a pinch, but if you run the phone's battery down, you will lose your phone service in addition to being stuck in the dark. Do you have a must-have travel item? Please share. If you receive my blog posts by email, you probably thought it was a bit ironic that my last post talked about proofreading and using spell check when the post was full of typos. Although I followed my own advice and did just those things before posting, it seems that Mr. Google wanted to prove that he knows more than I do because he removed the spaces between several words after I clicked on the Publish button. Despite all your planning, sometimes you just can’t control the way things turn out. So you make adjustments, offer an apology and move on. I just hope Mr. Google hasn’t put a hex on me. When I ran into one of my friends last week, she suggested that I use my writing skills to help guys create presentable online dating profiles. She told me that most of the ones she’s read are full of typos, and she is turned off by anyone whose first obvious trait is poor writing skills. Whether you’re trying to get a date, writing a report for work or school or sending an email, taking the time to correct the errors can make a big difference in the way your reader perceives you. Even if you have edited carefully, be on the lookout for these common errors, which spell check won’t detect. You’re is short for you are. Example: You’re going to win. Your is possessive. Example: I have your jacket. Add an s to make it plural. Example: The dogs are outside. Use an apostrophe followed by s for a possessive. Example: The man’s jacket is on the chair. An apostrophe followed by s is also used as a contraction for a noun followed by is. Example: The girl’s going out. Another point of confusion is how to form the possessive of a family name. For example, if you are going to give the Smith family a sign for their new home, it should say The Smiths’ and not The Smith’s because The Smith’s means that the house only belongs to one person named Smith. While the above rule tells you to add an apostrophe and s to a noun to make it possessive, its is an exception. Therefore, you would say that the house lost its roof. It’s is short for it is. Example: It’s going to be a great day. Who’s is another exception to the rule that calls for apostrophes for a possessive. Who’s is a contraction for who is. Example: Guess who’s coming to dinner. Whose is possessive. Example: Whose life is it anyway? There is a preposition. Example: There is a place I love to go. I often go there. Their indicates possession. Example: I like to go to their house. They're is short for they are. Example: They’re going with us. Too means also or excessive. Example: I am going, too. That is too much. To has several meanings. It refers to a direction, as in I’m going to the store. It also refers to a limit, as in six to nine hours. To is also used as part of an infinitive, which is the basic form of a verb. Example: I am going to run in the race. When did mixing up these two words become the norm? Lose is the opposite of win. If you forget whether it's one o or two, remember that it is the same as the past tense, lost. Loose is the opposite of tight. There are several other words that have similar spellings, but have completely different meanings, such as dessert, which you eat after dinner, and desert, which is a dry area, like the Sahara. When in doubt look it up. It could mean the difference between a hot date and a being stuck home alone watching reruns. In a recent episode of Househunters International, a woman was hunting for a Paris flat that she and her husband could rent to tourists after using it for a long-term business stay. If you were wondering who would ever rent a property in another country and why, I will be glad to tell you. I have rented four apartments in Paris when my stays lasted a week or more. For the same standard of living in hotels, I would have spent a lot more. My apartments offered amenities that a hotel did not, most notably a kitchen, which was a huge convenience at breakfast time or when I was too tired to eat out or just trying to save some money. It also gave me the opportunity to enjoy one of my favorite aspects of French life: wandering through the markets in search of fresh vegetables, cheese, baguettes and other goodies for meals. I didn’t even miss the maid service. HomeAway is a reputable site recommended by several travel magazines. Renters can search the site based on all sorts or criteria, even whether the property has Internet access. If you register, you can create a list of favorites, and the site records which properties you have contacted. Best of all, the site provides protection against Internet fraud. HomeAway has some sister sites, including vrbo.com and Homelidays.com. While most of the properties are the same, it’s worth looking on them because you can sometimes find some additional ones. New York Habitat offers properties in New York, Paris, London and the South of France. Unlike HomeAway, which is not involved in agreements between renters and property owners, New York Habitat is a leasing service, so you will deal with an English-speaking agent who can provide a list of apartments based on your criteria or simply facilitate a rental agreement for an apartment you find on the website. This company also handles long-term rentals. Location: If you’re staying in a city, you don’t need to pay high rates to be in the tourist area. As long as you are close to public transportation, and it looks like a decent neighborhood, you should be fine. Beware that some listings show the center of town on the map rather than the property’s actual address. Be sure to verify the address and look it up on Google maps. You can also research the neighborhood on tripadvisor.com or other travel forums. Language spoken by the owner: If you are not using an agent, check the listing for languages spoken by the owner. Many of them speak English, but you could run into problems if you don’t speak the local language and the owner doesn't speak English. If the owner speaks English, the contract could still be in his native language. In that case, use Google or a free translation website to translate to English. Floor: Since many old buildings in Europe do not have elevators, I learned the hard way that you should always ask which floor the apartment is located on if the listing doesn't mention an elevator or indicates that it’s unsuitable for the elderly or infirm. Dragging a heavy suitcase to the fifth floor is one thing I will never do again. Also, what Europeans call the first floor, we call the second, so add one to the number you’re given. Floor area: Space is limited in other countries, especially in the cities, so it’s important to check photos and floor area to make sure you’ll have enough space. Beds: This is an important issue, especially if you are traveling with other people or a person who is not your significant other. If you’re looking at a studio, the bed may be a sofa bed. Again, check the photos closely. Noise level: If you’re staying in the city, it’s convenient to be close to a lot of commercial activity, but it could also make for some sleepless nights. Find out if the double glazed windows (double vitrage in French). It could make or break your trip. I always bring ear plugs just in case. Air conditioning: While most American buildings are air-conditioned, this is not the case in other countries. Check the average temperatures for your destination and decide whether this amenity is necessary. Payment form: Most rentals require a deposit of 25 to 50 percent. Before signing a contract, make sure you can pay in the form requested, typically PayPal or a bank wire. Some apartments accept credit cards. Note that some banks don’t offer wire services. If they do, they usually charge a fee of $30 to $45 and a currency conversion fee of one to three percent of the amount wired. Owners may charge an additional fee for PayPal or credit cards. Security deposit. Most owners require a security deposit when you sign the lease. The amount will be mentioned in the listing. Be sure to find out how you will recover the deposit at the end of the trip. Typically the owner will give you cash when you leave. You’ll probably return to the United States after renting the apartment, and if you’re splitting the deposit among several people, it shouldn't be a big deal to spend the foreign currency on cab fare to the airport and last-minute souvenirs or to save it for a future trip. However, if you are footing the bill on your own, you’ll have to decide if it’s worth it to hang on to the cash or lose a bit of it when trading it for greenbacks. Note that owners sometimes send a check to the renter a week after the rental, which is not convenient for foreigners. Additional fees: Is there a cleaning fee? Are utilities included? Are sheets and towels included? The best places go quickly, so find a place well in advance, especially if you are going during peak travel times, like summer, Christmas and local holidays. Contact several owners because some places may have been recently booked for your preferred time although the schedule says they’re available. Also, some owners don’t respond if they are busy, or if they have booked the property. Don’t book with the first owner who responds if you’re not absolutely sure you want the property. It sometimes takes a few days for owners to respond. Allow at least a week for a response on a property you really want. If dealing with the foreign language, security deposit and payment to a stranger is too much for you, but you still want the apartment experience, try an apart’hotel, which is basically a hotel room with a kitchenette. Apart’hotels don’t offer the local charm of most privately owned apartments, but they usually accept credit card deposits, they don’t require a security deposit and there is usually someone on staff who speaks English. In addition, you can stay at most of them for a few days. StudiosFloreal: located next to the tram by the main train station in the middle of the main shopping area of Jean Médecin. It’s a very lively area, but double-glazed windows block the noise. Ajoupa Baie des Anglais: in an ideal location on a pedestrian street just off the beautiful Place Méssina. It’s very clean and reasonably priced, so book early because rooms go quickly. Renting an apartment isn't for everyone. If you want to live like a native, though, it’s the best way to go. Where would you like to immerse yourself? The 2012 Olympics offer an unprecedented amount of coverage, with programming running almost around the clock on several television channels. In addition, fans can keep up online and with apps for smartphones and tablets. As the media scrambles to keep our attention, they continue to churn out obscure facts about London, the Olympics and specific athletes. Following is a list of some of the oddest and most interesting things I have learned during the first week of the Games. I'm not sure if it's all true, but it's what I've heard. The London Tube is the oldest subway system in the world, dating back to the mid-1800s. It’s been around so long that a species of mosquito unique to the Tube has had time to evolve. London taxi drivers have to memorize the location of all of the streets and landmarks in the city, and they must pass a test to qualify for the job. The pass rate is only 50 percent. While tea is the most popular drink in England, with 156 million cups consumed per day, it was such a rare commodity in the 17th century that servants weren't permitted to touch it. The Brits give credit to the Duchess of Bedford for giving birth to the ritual of afternoon tea, but claim that the requirement of extending the pinkie is a myth. The Olympic medals are stored in a vault in the Tower of London until they are awarded to the winners of each event. Legend has it that if the ravens leave the grounds of the Tower of London, the white tower will crumble, and the monarchy will fall. Therefore, London’s most popular tourist attraction is required to have six ravens on hand at all times. There are also two backups in case something happens to the official birds. A group of ravens is called an unkindness, not a flock. The opponents of Baltimore’s football team probably consider this an appropriate name. 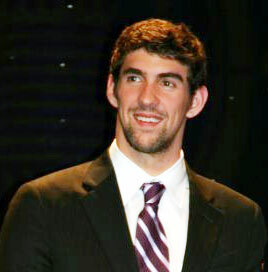 Michael Phelps consumes 12,000 calories per day. That’s six times the recommended rate for the average man. London is hosting the Olympics for the third time, but Queen Elizabeth’s grand entrance in 2012 marked the first time she has attended the opening ceremonies. In another first, Wimbledon will not enforce the rule that tennis players wear predominantly white during the Olympics. Showing her true colors, Venus Williams is sporting a patriotic hairdo with red, white and blue braids. While, the governments of most countries fund the athletes who participate in the Olympics, the American government does not. The men and women who marched under the sign of Independent Olympic Athletes in the parade of nations at the opening ceremonies come from the former Netherlands Antilles and the newly formed South Sudan. While I can’t verify that volleyball is the only Olympic sport that has cheerleaders, I have not seen them at any other event in London, nor have I noticed them at a previous Olympics. Along the same lines, beach volleyball matches now feature dancers. Horses that participate in the equestrian events must have a passport and a microchip to travel. The American team’s horses were placed in huge containers and flown to London in FedEx planes. The marathon has been one of the most well-known events since the Olympics began, but the women’s event was not introduced until 1984. The Australian flag is red, white and blue, but the country’s athletes normally wear green and gold uniforms. The Australian athletic community adopted these colors after its country’s cricket team wore them during a British tour in 1899. Green and gold represent the golden wattle, Australia’s national flower, as well as the colors of the landscape. The last Olympic gold medals that were made entirely out of gold were awarded in 1912. This year’s medals, designed by British artist David Watkins, are the heaviest and largest in Olympic history. This guy needs no introduction. The following story was not discussed during the Olympics, but I heard it several months ago, and it stuck with me. At the 1936 Olympics in Berlin, Jesse Owens famously humiliated Hitler by winning four gold medals. His roommate Louis Zamperini, although virtually unknown, was also a hero. A member of the Army Air Corps, his plane was shot down in 1943, and he survived 47 days at sea before becoming a prisoner of war for two years. Captain Zamperini won several awards for his valor. He wrote “Devil at My Heels” and is the subject of the book “Unbroken,” both of which tell the story of his remarkable life. Please share the interesting trivia you have learned during the Olympics. I was born and raised in the Philadelphia area and landed in Baltimore in 1996. A product of the Catholic school system, I had no choice but to find a career in communications since I spent the majority of my education studying English. Luckily, I enjoy writing. I have edited a magazine and multiple newsletters, written and produced an e-newsletter, managed a health and wellness website, written many brochures and other publications, and I’ve even helped to launch an iPhone app. I believe in giving back to the community, and I’ve used my skills to help promote some local non-profits. I love art, and I am an avid photographer. 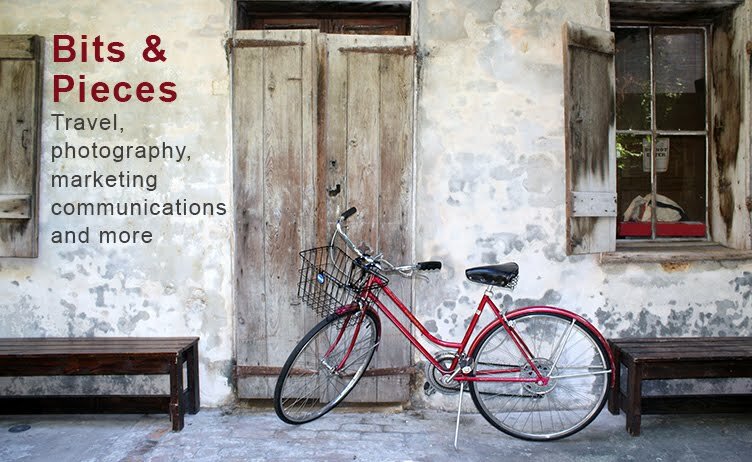 I also love to travel, and I use photography to share my journeys with others. Through my blog, I hope to share some of the things I’ve learned through my experiences. I hope you enjoy reading. I welcome your comments because it lets me know you're reading. All articles and photos copyright Joanne Drummond. Reproduction is prohibited without permission. Awesome Inc. theme. Powered by Blogger.